The Grateful Dead announced today that the band will donate its archives to the University of California, Santa Cruz. Band members Bob Weir and Mickey Hart made the announcement this morning at a press conference held in the poster room of San Francisco's historic Fillmore Auditorium. Documenting the history of the band from 1965 to the present, The Grateful Dead Archive will reside in the University Library's Special Collections at UC Santa Cruz. The focal point of the collection will be a dedicated room named "Dead Central," where both academic researchers and the general public will have access to the archive. "The Grateful Dead Archive represents one of the most significant popular cultural collections of the 20th century; UC Santa Cruz is honored to receive this invaluable gift," noted UC Santa Cruz Chancellor George Blumenthal. "The Grateful Dead and UC Santa Cruz are both highly innovative institutions-born the same year-that continue to make a major, positive impact on the world." The Archive includes business records and correspondence, photographs, and show files with tickets and backstage passes--as well as promotional items such as flyers, posters, shirts, press clips and awards. Framed photos by renowned photographers and unreleased videos of interviews and TV appearances will be available for viewing. Large stage backdrops, stained-glass pieces, and props from live performances are also featured. An extensive collection of Deadhead fan mail and gifts is an important part of the collection. "We are excited that The Grateful Dead Archive will now have a home at UC Santa Cruz," said Christine Bunting, the head of Special Collections at the University Library. "It will provide extraordinary opportunities for researchers and the public to examine the music of one of the most influential bands in history, as well as explore the cultural phenomenon of Deadheads-the most dedicated and celebrated fans in music. The study of popular culture has become an important focus in the academic disciplines of the arts, humanities and social sciences." Bunting added that as it works to preserve and prepare the archive for public use, UC Santa Cruz will be forming creative partnerships with Rhino Entertainment (distributor of the band's music and home of the Grateful Dead web site, dead.net), as well as the Rock 'n' Roll Hall of Fame and key high-tech companies in Silicon Valley. 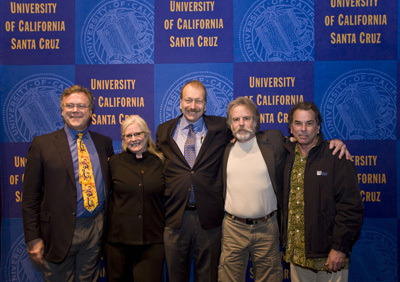 Two foundations established by members of the Grateful Dead previously contributed to UC Santa Cruz in 2004. The Rex Foundation, founded by the Grateful Dead and friends, and the Unbroken Chain Foundation, established by Phil and Jill Lesh, each donated $10,000 to support the campus's archive of maverick composer Lou Harrison. UC Santa Cruz music professor Fred Lieberman helped to facilitate those gifts; Lieberman is coauthor of two books with band member Mickey Hart--Planet Drum and Drumming at the Edge of Magic. Bunting noted that due to the monumental size and scope of the archive, a fundraising campaign is now being launched to support it and to endow a permanent Grateful Dead archivist position. She said that she anticipates the archive will be of great interest to thousands of people around the world. "We looked around, and UC Santa Cruz seems the best possible home," Weir noted. "If you ever wrote the Grateful Dead a letter, you'll probably find it there!" For more information about The Grateful Dead Archive at UC Santa Cruz, go to: library.ucsc.edu/speccoll/GD_archive.html.